The letter G describes an analytical and philosophical girl who loves to study and travel. These girls are thoroughly imaginative, which makes them extremely inspiring to be around. Their way of thinking is completely out of the box, and their souls are visionary. These creative individuals and lateral thinkers rely a lot on their instincts and analyze things from every angle before taking the final decision. In numerology, the letter G is associated with the number seven, which explains their high expectation from other people and disappointment when the expectations are not met. These meditative personalities are highly attracted to religion and spirituality as well. The only concern is that G girls do not pay heed to advice and don’t like to listen to anyone whose thoughts do not align with them. So your girl can give you a pretty hard time in her teens. Also, the great intelligence and brain power can even bring drawbacks such as irritability and indecisiveness. But with the correct guidance, she can surely leave a strong mark on the world. So if you’re searching for an uncommon baby girl name starting with G, you’re at the right place. 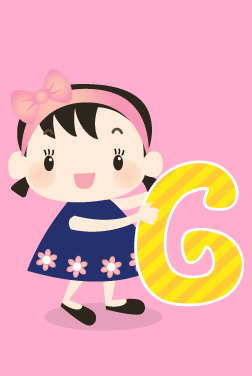 Apart from traditional ones such as Gabrielle, Grace, and Gina, there are hundreds of other baby girl names starting with the letter G in MomJunction's tool. Take a look!